WATERLOO – Wilfrid Laurier University has received nearly $400,000 from the Lyle S. Hallman Foundation of Waterloo Region to fund an innovative program that will help 30 non-traditional students begin their studies at the university. The program is offered in collaboration with The Working Centre, an independent and inclusive social service agency in downtown Kitchener. Through the Laurier Access to University (A2U) program, Laurier’s Faculty of Arts in partnership with The Working Centre will assist non-traditional learners—new Canadians, Indigenous people, those dealing with disabilities, older unemployed workers—who wish to pursue higher education but who face different challenges from students enrolling directly out of high school. The Working Centre will identify and provide individual support to two cohorts of 15 non-traditional learners over two academic years, beginning in September 2016. After a term of individual and group preparation, students will begin their part-time studies in January 2017 with a special course offered at The Working Centre by a Laurier faculty member. In each cohort, students will take a series of courses designed to ease their transition to campus and allow them to complete their first full term. At the end of the second year of the program, successful participants will be able to continue their studies at Laurier or another post-secondary institution, ultimately earning undergraduate degrees if they choose. The program design was based on a successful pilot project funded by Laurier’s Faculty of Arts and offered at The Working Centre this past winter, which enrolled 11 participants, nine of whom successfully completed the course. 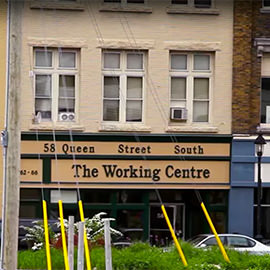 The Working Centre, located in downtown Kitchener, is a network of practical and inclusive community development projects that includes the Job Search Resource Centre, St. John's Kitchen and Outreach supports, Money Matters, affordable housing, and other creative projects such as the Queen Street Commons Cafe, Recycle Cycles, Commons Studio, and Community Access Bikeshare.